I recently got an email from a woman who said she was losing her mind trying to find out the truth about frying pans. Many articles say dangerous chemicals are released from various types of frying pan. We already have enough things to worry about; now I’m supposed to be afraid of my frying pan? Nope, not me. The headlines say things like, “Best Non-Toxic Cookware Options: Don’t Let Your Cookware Kill You” and “Cookware is a scary toxic minefield.” The unreliable Mercola website says “Hundreds of Scientists Issue Warning About Chemical Dangers of Non-Stick Cookware” and “Another Reason to Ditch Your Non-Stick Cookware.” He explains that non-stick coatings contain PFOA (perfluorooctanoic acid). When these pans are heated, the non-stick coating breaks down and releases toxins into the air. He says PFOA is accumulating in human blood at an alarming rate. It stays in the body for many years. In laboratory animals given large amounts, it can affect growth and development, reproduction, and liver damage. But mice are not the same as humans. Any exposure to PFOA from frying pans is much less than the large amounts given to the mice. The central principle of toxicology is that the poison is in the dose. The amounts that have accumulated in humans have never been shown to cause any harm. What about human studies? He cites studies showing that PFOA was associated with an increase in the chance of infertility and that people with the highest PFOA concentrations in their blood were more than twice as likely to have thyroid disease than those with the lowest levels. These studies only show correlation; they are not evidence of causation. He says the Environmental Working Group’s report noted similar concerns about cancer, reproductive problems, immune system problems, hypothyroidism, birth defects, and organ damage. All based only on apparent correlations. Correlation is not causation. Autism is correlated with organic food sales. 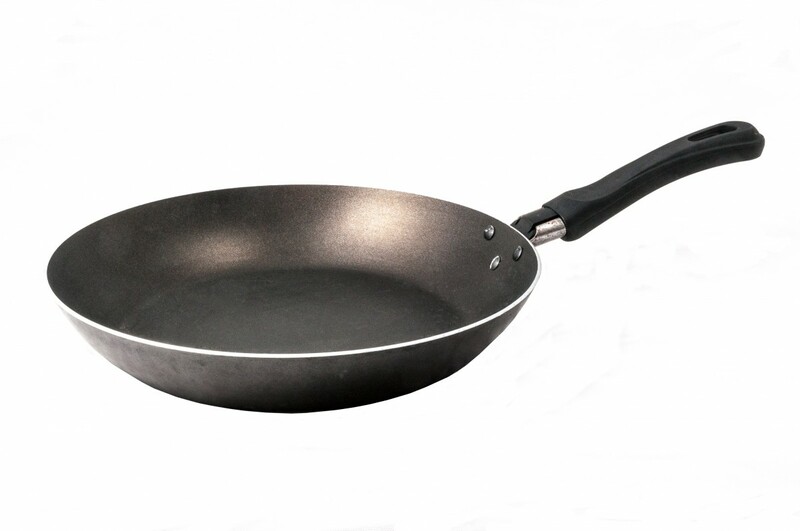 Polymer fume fever (PFF) is a disease usually related to occupational exposure but can be caused by PFOA fumes when a nonstick pan is heated to very high temperatures (over 600 degrees F or over 842 F according to different sources). PFF is a self-limited illness characterized by fever, shivering, sore throat, and weakness, with minor pulmonary symptoms. It typically occurs several hours after exposure and resolves in a day or two. In one suspected case of PFF reported in the British Medical Journal, a man awakened from a five-hour nap to find the room filled with white smoke from a pan on the fire that was not turned off. When he turned the fire off and put the pan under running water, an explosive vapor came out from the surface of the pan, and several hours later he felt fatigue and dyspnea and sought medical attention. His symptoms were completely resolved after three days. In another case, a patient had more than forty attacks of polymer fume fever attributed to contaminated cigarettes; there were no permanent ill effects. In yet another case, symptoms developed after fumes were produced when water in the pan was allowed to evaporate. The patient recovered without treatment. While various sources say PFF can (rarely) lead to serious illness and death, I couldn’t find any case reports of human deaths caused by PFOA. Birds have died; they are very susceptible. In one reported case, five cockatiels died and the owner had symptoms of PFF for twenty-four hours after a non-stick pan accidentally overheated. PFF seems to occur with accidental overheating; I couldn’t find any case reports of PFF with typical use of nonstick pans in cooking. Another concern is that bits of the non-stick coating can flake off and be ingested; the flakes are eliminated from the body, not absorbed, and are not harmful to humans. Who ya gonna believe? I’ll take the American Cancer Society over Mercola any day. At least they don’t recommend lead. Dr. Mercola sells his own brand of ceramic pans, and guess what? They have been found to contain lead! Several companies agreed to phase out PFOAs, but the chemicals that replaced them have not been as well studied. PFOAs are no longer manufactured in the United States and are not imported; but some older pans with PFOAs are still in use. Teflon no longer contains PFOA. It does contain polytetraﬂuoroethylene, which carries the same concerns about overheating. Temperatures sufficient to make most cooking oils smoke could result in polymer fume fever. I’m not worried; but if you are, you can take precautions. You can avoid using prolonged high heat for cooking. You can be careful not to leave empty pans on a hot burner. And you can keep your pet birds out of the kitchen. Or you could switch to another type of cookware. There are warnings about some of them, but they don’t amount to much. Aluminum: Despite alarmist rumors about Alzheimer’s and neurotoxicity, it is perfectly safe to cook in aluminum cookware. Copper: Can leach into foods, especially when exposed to acidic foods, such as tomato sauce. But copper is a vital nutrient. Small amounts are good for us, and you won’t get a harmful amount from copper cookware. Ceramic, enamel, glass: Lead is used in some ceramic, enamel, and glass cookware to reduce the chance of breaking. There is no evidence of harm from cooking with these. There are also warnings about nickel and cadmium found in some coatings. Again, there’s no evidence that they harm the users. Stainless steel: A composite of different metals, stainless steel has the potential to leach tiny amounts of nickel, chromium, molybdenum, titanium, and other metals, which might be problematic for those suffering from metal sensitivities. However when used for short cooking times, there is very minimal leaching due to the stability of the metals. Cast iron: Cast iron pans may expose you to small amounts of iron, but iron is an essential nutrient that helps prevent anemia. Unless you have an iron storage disease like hemochromatosis, this shouldn’t be a problem. I’ve used all kinds of pans but have recently gone back to cast iron, not for health reasons but for convenience and practicality. I prefer it because it doesn’t chip, can’t break, will last forever, goes straight from stovetop to oven, and if properly seasoned and maintained it is at least as non-stick as the non-stick pans. It’s easy to clean: just don’t use soap, because that destroys the seasoning. The bottom line: Use whatever kind of pans you prefer. The foods you cook are more likely to harm you than the pans you cook them in.